A gravel bike is an exciting machine. It is descended from a traditional road bike but with a few crucial adaptations which make it so much more versatile. They were designed for the long gravel roads that are found all across America. Cyclists knew these would be a perfect place to ride, but there wasn’t the ideal bike for them. And so, the gravel bike was born. Gravel bikes combine the geometry of a road/racing bike, but they are given adaptations to allow them to be used away from the tarmac. In practice, this means thicker, knobblier road tires and frame clearance to match. In addition, they usually have disc brakes, which enhance the clearance and allow for a thicker tire. They’re lightweight and usually don’t carry any suspension. Depending on the model they can be taken on a really wide range of terrains. Because of this combination of speed and versatility, they can also be a great choice for commuters. In this article, we’ve surveyed five different models from across the world of gravel bikes. They come in a variety of prices and styles. In each case, we’ve told you what’s great about them. One look at this bike tells you it’s not an average mountain bike. It clearly has the geometry of a road bike and drop-handlebars to match. It is designed for children aged 9-12 who want the versatility of a gravel bike or who want to try out cyclocross. Raleigh is a hugely reputable brand with years of experience in the cycle industry, so you know you’re getting excellent quality. It features a high-end SRAM (another renowned manufacturer) Apex 1×10 drivetrain which offers excellent pedaling efficiency. It offers mechanical disc brakes at the front and rear, providing excellent stopping power under any circumstances. The wheels are 24″, designed for children. The mountain bike tires are Kendal cross CYCLO 24″ x 1 3/8″ and have excellent grip, they’re suitable for all but the worst of conditions. Why We Like It – For a kid who wants to get out and about on the tracks and gravel while moving at speed, this bike offers exceptional value for money. It is made with really high-end components and will offer you a reliable ride in all sorts of conditions. Tommaso is another brand with years and years of experience. This is a serious, high-end bike that comes with an astonishing array of features. It comes with 700x40c tires which offer great versatility and stability. The bike used to be fitted with slightly narrower tires, but they’ve adapted to the needs of gravel users. It has an aluminum compact frame and an SST steel fork which combines the best properties of both materials. It has an impressive fully Shimano groupset, promising the highest level of pedaling efficiency. The Avid BB5 disc brakes offer excellent stopping capacity in adverse weather conditions. The frame is drilled for all varieties of bike racks and fenders meaning it would also make for an exceptional commuting bike. What’s more, the matte black paint job looks stunning. Why We Like It – A very high-quality bike made with a combination of imaginative materials. It would serve equally well as a bike for a commuter or someone who wanted an adventure. A great fusion of speed and durability. 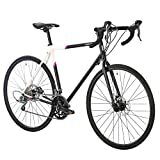 This gravel bike tends towards a touring design, making it ideal for longer, more comfortable rides. 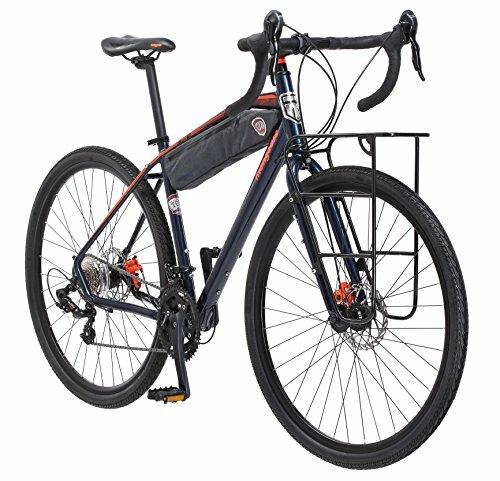 It is a bike that is built for adventure and comes with a large front rack that would be equally suited to carrying your work things or your camping gear. The rack even has a bottle opener built-in, so all you have to bring is the party! It has a slightly more relaxed geometry than some gravel bikes, encouraging a more comfortable riding position. There’s an integrated frame bag which is perfect for storing cycling essentials such as your mini-pump and puncture repair kit. 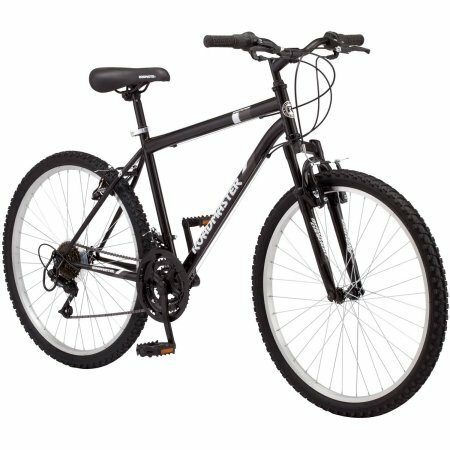 The bike has a great alloy frame that’s durable and not too heavy. It has a 2×7 drivetrain which gives you good versatility without being too complicated. There’s room for three water bottle mounts, so you’ll never run out of the water. Why We Like It – It’s an adventure bike in the truest sense of the word. It has excellent potential for touring which means you can get away and explore. For the price, it’s a perfect entry-level gravel-touring crossover. This is the next level up from the other Tommaso model. It has the same wide tires that are featured on the model above. Similarly, it has the same 3×8 Shimano Claris groupset. Both of these provide excellent stability and functionality. They make for a bike that is great for achieving top speeds on outdoor trails. Where this bike levels up is on its high modulus carbon fiber fork. It replaces a steel fork in the other model. Carbon fiber is a much, much lighter material and is used on top-of-the-range bikes. It has a great capacity for durability alongside this lightness. This substitution means that the bike weighs considerably less, saying it has better acceleration and handling. It comes in a little more expensive, but there is also a broader choice for paint jobs. Why We Like It – A bike for the serious rider. It’s made from top-of-the-range materials and won’t disappoint under any conditions. The carbon fiber fork gives the bike an impressively low weight. This bike takes the principles of a gravel bike and offers them at an extremely affordable price. It has a geometry that is closer to that of a mountain bike, but it has minimal suspension: offering a straightforward suspended fork. The frame is made of a durable steel alloy. The tires are nice and wide and have great grips, offering good traction on a range of off-road surfaces. There’s an 18-speed gear system which means you can tackle tough climbs. The price is frankly almost unbeatable, and you get a good machine for your money. The bike doesn’t have disc brakes, so be cautious if you’re riding in tough conditions. Why We Like It – If you’re looking for a cheap bike that’ll suit a variety of terrains, this offers great value for money. It may not have lots of high-end features, but it offers great functionality for an affordable price. When you decide on your gravel bike, you’ll be weighing up exactly what you’re looking for. A gravel bike gives you the potential to transition from tarmac to off-road with ease. It makes for an exceptionally versatile bike that doesn’t compromise on speed. There are a few different features that vary within gravel bikes, and it’s worth thinking what it is you’ll primarily be using the bike for. This will obviously effect which feature you want to prioritize and which features you might be able to economize on. Below, we’ve listed some of the essential components that define gravel bikes. We’ve explained what you should look for in them to suit your specific needs. Most gravel bikes have disc brakes. This is for two reasons. First, they provide superior stopping power in worse weather conditions. Often with V-brakes or caliper brakes, one whole revolution of the wheel is required to remove the water or mud before braking can effectively start. With disc brakes, the stopping power starts as soon as the pads touch the brakes. 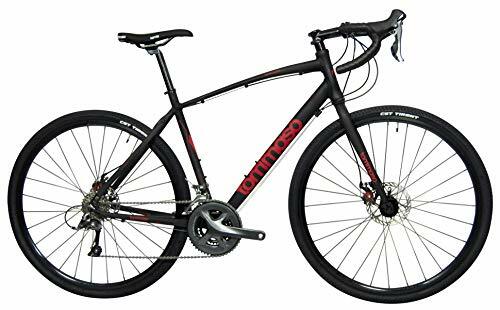 The second reason is that disc brakes allow for a wider wheel without having to widen the frame as the braking mechanism is located lower down. This means the fork can be narrower and lighter, more like that of a traditional road bike. This actually gives extra speed in the long run. Disc brakes are a higher standard of braking technology, but they do mean your bike will be pricier. If you’re willing to compromise, then V-brakes remain a reasonable option for fair-weather riding. Because gravel bikes are designed to be ridden off-road, they need tires to match. The thinner tires that are found on road bikes don’t offer enough contact with unstable road surfaces and make falling off unlikely. The thicker your tire is, the more stable your ride will be. It does mean you have to compromise a little on potential speed, but with uneven road surfaces, you’re very unlikely to reach those speeds in any case. When you’re looking at tires, bear in mind width and the level of grip they have. The more gippy and the wider, the safer they’ll be for off-road riding. If you’re not planning on riding on such uneven tracks, this may be less important to you. The frame is the heart of any bike. It is nearly always its heaviest part too. This means that whatever material your frame is made from will have a huge effect on the overall weight. Aluminum alloy is a great compromise between strength and weight. Because most gravel bikes don’t have suspension, this can mean a lot of force is transmitted through the fork. The rockier the road, the more force is transmitted. For this reason, a lot of gravel bikes have forks which are made from a more durable material than the frame, like steel. Carbon fiber is incredibly strong as well, but it is much lighter. It is much more expensive too, though. Finally, the geometry of your bike is something worth considering. If you’re planning on long rides, consider a geometry that encourages a more comfortable, upright position. Racing geometries, on the other hand, encourage a more horizontal riding position that allows for greater speed. Like all bikes, there’s an extremely wide range to choose from when it comes to gravel bikes. They come in a variety of sizes and prices. It’s worth first determining your budget by considering how serious you are about gravel biking as a sport. If you’ve already tried some and know it’s something you love and are going to keep doing, it might be worth making an investment into a product that you’ll really enjoy and will last you a long time. 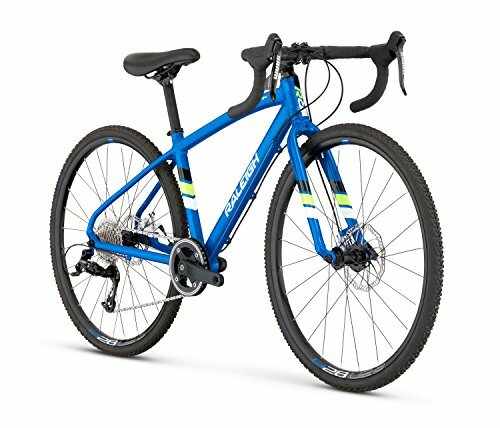 If you’re looking for something that is a versatile bike that can get you out onto those gravel tracks, there’s something for you here too. Whatever decision it is you make, ensure to choose something that’ll make you comfortable and give you plenty of stability while you’re out riding.